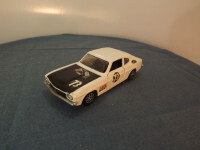 This model is the Corgi 303-B-2 Ford Capri 3L GT in White and Black, Team Ford livery. It has been designed and marketed as the Roger Clark #73 car. 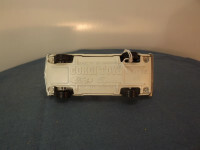 This model used the newly tooled 303/311/331 casting. It has opening front doors only. At the front is the black painted grille and the front headlights are represented by oblong, cut, clear lenses inset into the cast body. Below the grille is a lightly plated metal and underneath this, as part oft he base casting, is the front numberplate [ETW 882] in black lettering on yellow background (thin paper label?). The bonnet is painted matt black and carries a cast "Ford" across the front edge, the racing number "73" in white on a black background (decal), and the Ford Sport logo with Union Jack and Chequered flags (decal). To the sides are sponsor's advertising (Castrol, Autolite, Ford and Goodyear) and the front doors carry the racing number "73" in white on black background (all are water-slide decals). 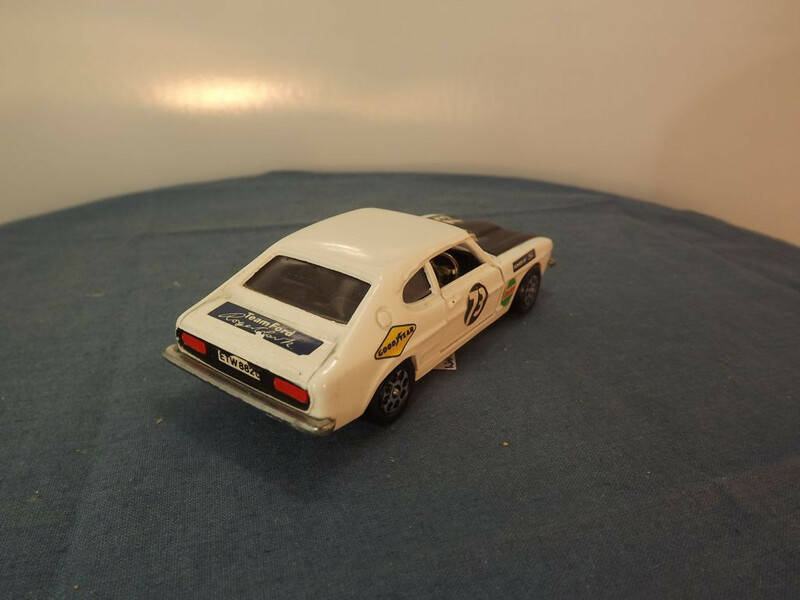 At the rear the boot has "Team Ford, Roger Clark" in white on blue background. The rear lights are represented by opaque red plastic inset into the lower body which is sprayed matt black and also carries the rear number plate [ETW 882] in black on white background. The rear bumper appears to be lightly plated metal. The interior is all black plastic with a right hand drive, goldish metal steering wheel inserted into the black plastic dashboard (instrument panel). The front seats have folding backs and the interior also includes a tiny black gear stick and hand brake. The glazing is clear all round. All wheels are of the "speed wheel" type - hollow one piece plastic with a "chromed", 8 dot patterned "hub"in the center. The base plate is white painted metal and is marked in the top centre with "Made in GT Britain", Corgi Toys on line one of the middle centre, "Ford Capri" logos on the second middle line, "PAT.APP.3396/69" at the bottom centre and "3 LITRE GT" at the middle by the rear axle housing. It is held in place with four machined rivets. This model 303 was issued between January 1970 and 1972. Its scale was said to be 1:45. It has opening front doors only. At the front is the black painted grille and the front headlights are represented by oblong, cut, clear lenses inset into the cast body. Below the grille is a lightly plated metal and underneath this, as part oft he base casting, is the front numberplate [ETW 882G] in black lettering on yellow background (thin paper label). The bonnet is painted matt black and carries a cast "Ford" across the front edge and the Ford Sport logo with Union Jack and Chequered flags (decal). To the sides are sponsor's advertising (Castrol, Autolite, Ford and Goodyear) and the front doors carry the racing number "73" in white on black background (paper labels). A further racing number "73" in white on black (paper label) is centred on the roof (possibly the one clearly missing from the bonnet as the outline is still there). At the rear the boot has "Team Ford, Roger Clark" in white on blue background. The rear lights are represented by opaque red plastic inset into the lower body which is sprayed matt black and also carries the rear number plate [ETW 882G] in black on white background. The rear bumper appears to be lightly plated metal.